First Service can be YOUR credit union! Membership is open to everyone who lives, works, worships, or attends school in Franklin, Delaware, Fairfield, Licking, Madison, Morrow, Pickaway, and Union counties. What's waiting for you at First Service? Find out today at www.firstcu.com or visit our Hilliard Office at 2164 Hilliard-Rome Road. Experience the credit union difference today by opening an account at First Service, where you will find a combination of friendly service and a better value for your money. Your membership gives you access to lower rates on loans, competitive yields on savings, free ATM's nationwide, and a complete range of financial services. Switch for the Savings... Stay for the Service! *All loans and checking services on approved credit. Federally insured by NCUA. 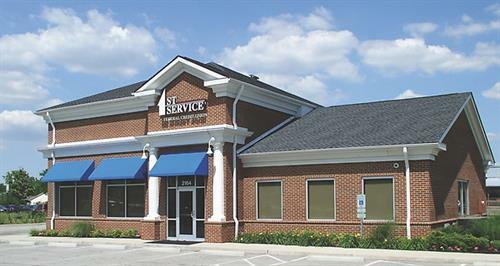 First Service is conveniently located at 2164 Hilliard Rome Road at the corner of Nike Drive.